First of all, tagine simply means a slow-cooked stew made with meat or poultry and spices. Vegetables, olives, and/or dried fruit such as prunes can be added. The flavor is typically rich and spicy. Tagines are often served with couscous, but spooning the stew over cooked rice is an alternative that appeals to me. I like rice. Place a heavy-based saucepan/dutch oven over medium-high flame and add the oil and butter. Add the lamb and brown on all sides. Transfer the lamb to a plate and set aside. Add the onion and cook until tender and translucent, about 5 minutes. Use a wooden spoon to loosen the fond (all those delicious brown bits) from the bottom of the pan. Add the minced garlic, give it a stir, and then add the stock, saffron, ginger, cinnamon, pepper, and coriander sprigs. Stir well and add the browned lamb. Cover, reduce heat to low, and simmer for 1 hour, turning the lamb over after 30 minutes. Add half the lemon zest (retaining the other half for garnish), cover and simmer for 30 minutes. 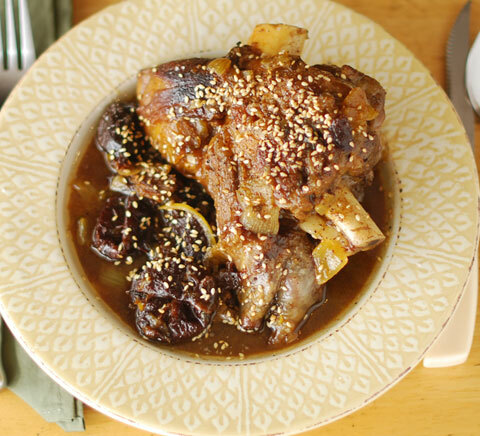 Add the lemon juice, prunes, and honey, cover and simmer for an additional 30 minutes, until the lamb is very tender. Meanwhile, toast the sesame seeds in a skillet. Remove from the pan and set aside for garnish. Discard the coriander sprigs (if you can find them). Adjust sauce for salt. Serve hot with couscous or over steamed rice. Garnish with toasted sesame seeds and lemon zest on the side (more for eye appeal than as something to eat).